Last weekend I wanted a light read and Hiding th e Past seemed like a good choice. I mean, what’s not to like…a forensic genealogist main character (Morton Farrier) and a murder mystery (who killed Peter Coldrick). The story has two plotlines: the murder mystery and the main character’s personal journey having to do with the knowledge that he is adopted. The former is dominant as it should be. The main character’s musings about the latter come and go in a logical way that doesn’t take away from the main plot or distract the reader from it. I didn’t see the ending coming for the murder mystery, but I wasn’t surprised at the resolution for the main character’s personal dilemma. Each ending was satisfying. I wouldn’t change a thing. The violence wasn’t graphic, a plus for me. And I enjoyed the links to records and locales interspersed within the text of the story. I’d prefer to give this book 4.5 stars instead of 4. The only downside for me was the setting. Not because I don’t like Great Britain, but because some of the language and abbreviations were foreign to me, me being American. I had to stop a few times and refresh myself on the meanings of things, and there was a slight learning curve with where records are stored in Great Britain as opposed to US repositories. These are minor problems, though, and I wouldn’t avoid this book, or any other with a foreign setting, because of this. 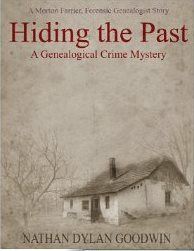 Hiding the Past was a delightful Sunday afternoon read. Morton Farrier is easy to like, and I look forward to the next book in this series.